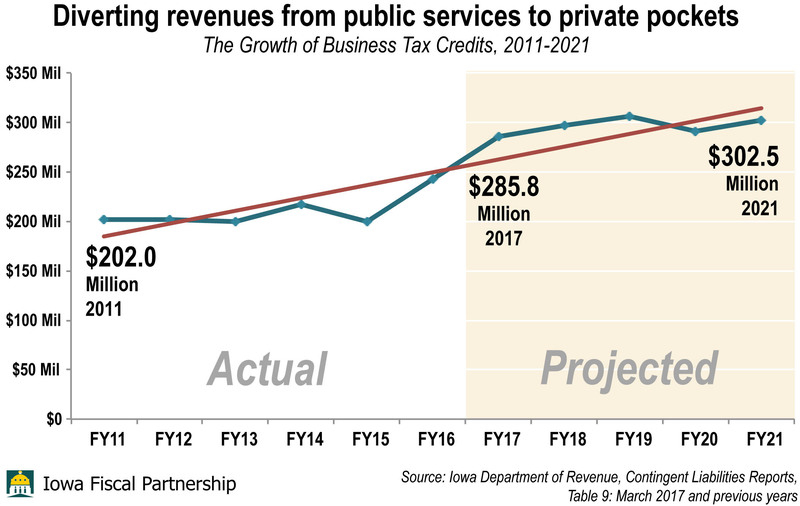 Iowa’s business tax credits will have grown by half from 2011 to 2021 under current official projections. That is where the spotlight needs to be. These interim legislative meetings put a spotlight on spending choices being made outside the budget process. You might have heard about a big meeting at the State Capitol today. No, not that one, about whose portrait will hang in the Iowa House and Senate behind the presiding officer. The meetings where there’s always some mystery are the annual reviews of selected tax credits. Only a few credits are reviewed each year by a panel of legislators. One meeting was in November; the other is today. One tax giveaway — er, tax credit — on the agenda for today is the Research Activities Credit, or RAC. No such review since these sessions started has produced meaningful reform, but the exercise does put information on the table and does put a spotlight on spending choices being made outside the budget process. What we already know from previous evaluations and annual reports about the RAC is that it is costly — over $50 million a year — and that routinely at least two-thirds of the cost (and usually over four-fifths) goes to companies as so-called “refunds.” These are not refunds of taxes owed, but of tax credits the companies didn’t need because they owe so little, or no, corporate income tax. Remember that when you hear the Iowa Taxpayers Association and others bleating about Iowa’s corporate taxes, which are actually low. For perspective on the RAC, the $42 million given away in tax credit refunds under this program in 2015 would have paid for about 1 percent more in school aid, at the same time schools were told we didn’t have the money for it. Of course we did. Our legislators just chose to give it away, mainly to huge, profitable corporations. In Room 103 of the State Capitol, 1:15 p.m., the public and legislators can hear from the Department of Revenue about the Research Activities Credit. And the session that follows at 2:15 on the Earned Income Tax Credit may be worth listening to as well, for contrast, as the EITC is a demonstrated boost to the economy while the RAC has never been demonstrated to be more than a drain on revenue. You never know what legislators at the table will have to say about these issues, but we may get some insights. As for that other meeting, we all now how it will come out. This is perfectly legal. In fiscal policy terms it’s a scandal, because it is legal. The millions Iowa gives to companies that do not pay state income tax is about the same amount of 1 percent in state school aid. That’s one takeaway from the latest annual report from the state on Iowa’s Research Activities Credit (RAC). That tax credit is used far less to ease taxes than to shovel subsidies to big corporations outside the budget process, whether they pay taxes or not. The report shows that in 2015, 248 companies had $50.1 in claims from this tax credit. Because the credit is refundable, companies get the full benefit no matter how much they owe (or don’t owe) in taxes. And the report shows that of those claims, 75 percent, or $42.1 million, were paid as checks to 186 companies that paid no corporate income tax to the state. As we note in a summary by the Iowa Fiscal Partnership, each percentage-point increase in Supplemental State Aid for schools costs about $41 million to $43 million (Iowa Association of School Boards estimate). What’s more, the largest claimants — 20 corporations receiving over $500,000 from this credit — took the lion’s share of the benefit with $43.9 million overall (about 88 percent). Many millions are spent this way every year, outside the budget process. These companies don’t have to compete for what are supposedly scarce public dollars needed for critical public services such as education, health care, environmental protection and public safety. The latter types of spending must compete in the budget process. The Research Activities Credit is only an entitlement. And except for the occasional lawmaker willing to stand up to restore some accountability, there is silence from the General Assembly. This is perfectly legal. In fiscal policy terms, however, it’s a scandal, because it is legal. Lawmakers refuse to even consider whether to take this spending off autopilot. When they claim the state is too strapped for money to provide more for school aid or human services, lawmakers should admit they let corporations take what they want first. It is not too late for Iowa lawmakers to address these issues and include some water in the tax credit reform glass. We said that in 2010, and we can say it again in 2015. It was a brief, shining moment for Iowa, and it came five years ago today. A special Tax Credit Review Panel appointed by then-Governor Chet Culver, after an in-depth examination of all Iowa tax-credit programs, offered a 10-page review with some tough recommendations. • Impose an income test for the Tuition and Textbook Tax Credit. Action in the Legislature, unfortunately, fell well short of those bold proposals, as we noted in a report that spring. 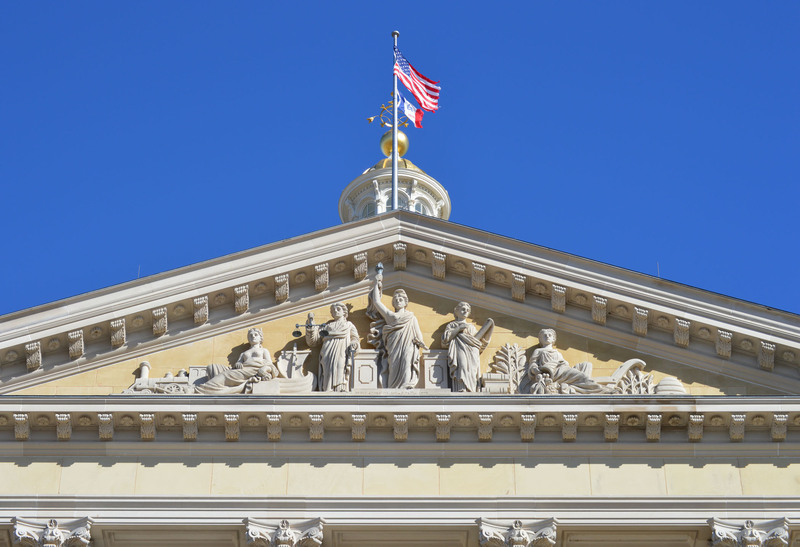 In their biggest moves, lawmakers set up a periodic review of tax credits but required no action to affirm the value of any credits, and they put light restrictions on some credits. Some of those limits already have been raised; the proposal to restrict the STO subsidy for private school tuition not only was ignored but the credit has been expanded. In short, five years later, Iowa is as lax as ever in its treatment of these subsidies. Under the sunset clause recommended back then, we would in 2015 be preparing for a round of debate and action to keep, expand, limit or eliminate certain tax credits. Instead, we have no expectation of any debate, let alone any action. If the credits are working, we don’t know because beneficiaries are not forced to show it. The seven members of the Tax Credit Review Panel, by the way, were Richard Oshlo, then interim director of the Department of Management; Fred Hubbell, interim director of the Department of Economic Development; Rob Berntsen, chair of the Iowa Utilities Board; Bret Mills, executive director of the Iowa Finance Authority; Cyndi Pederson, director of the Iowa Department of Cultural Affairs; Mark Schuling, director of the Iowa Department of Revenue; and Jeff Ward, executive director of the Iowa Agricultural Development Authority. Their work was good and important, and with hundreds of millions of dollars at stake, we should not forget it. *The Iowa Fiscal Partnership is a joint public policy analysis initiative of two nonpartisan, nonprofit Iowa-based organizations, the Iowa Policy Project in Iowa City, and the Child & Family Policy Center in Des Moines.